Northern Italy, perhaps Ferrara, ca. 1460-1475. 267 leaves (1 column, 11 lines), bound : vellum, ill. ; 94 x 65 mm. Rowland Gerson Hazard (bookplate on front pastedown); Walter Schatzki, New York; purchased by Julia Parker Wightman from Schatzki in 1946; JPW 2272; Julia Parker Wightman Bequest in 1994. Ms. book of hours, use of Rome (Hours of the Virgin); written and illuminated in northern Italy, perhaps Ferrara, between 1460 and 1475. Texts: fols. 1-12 - Calendar; fol. 13 blank; fols. 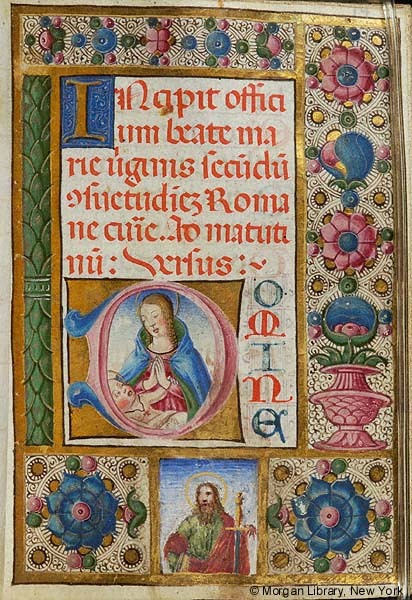 14-136v - Hours of the Virgin; fol. 137 blank; fols. 138-220 - Office of the Dead; fols. 220v-227 - Office of the Passion; fols. 228-229 ruled but blank; fol. 230-250 - Penitential Psalms; fols. 250-266v - Litany; fols. 267-269 ruled but blank. Decoration: 3 historiated initals, 2 historiated border vignettes, 4 full-page illuminated borders, 8 large illuminated initials. Binding: 17th-century dark brown calf, gold tooled, 2 clasps, gilt and gauffered edges, in marbled paper box, brown morocco spine, labeled: Latin Prayer Book, MS circa 1500, signed JPW 1946.